Loved that each room was different. The staff are very helpful and friendly. Staff very helpful and friendly. 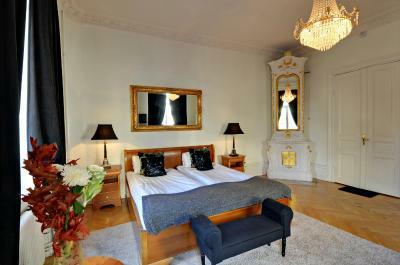 The room and the bathroom were clean, bed comfy and breakfast good with a variety of choices. Room and bathroom decor very outdated, however it was made clear when booking that the room due to be renovated. Decent breakfast and a nice non-obvious but convenient location. 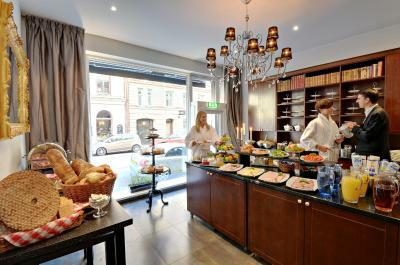 Nice hotel,helpful staff,good location,wanderful brekfast! 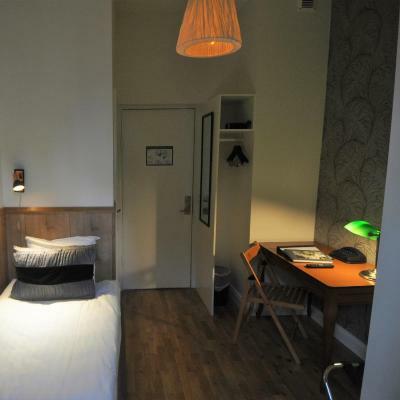 Hansson is a great choice for living quietly in a busy section of Stockholm. Great location, close to subways, busses. Nice area to walk in, many restaurants to choose from. 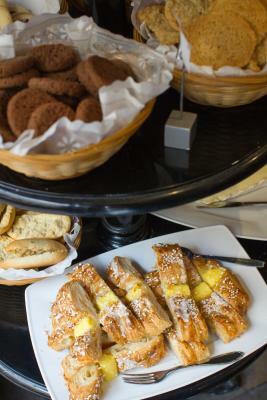 Staff is friendly, the beds are comfortable, breakfast is great with many choices. Plenty of time to check out at noon. the staff was very friendly and helpful. 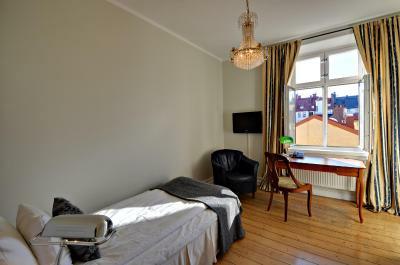 location is good bus station next to the hotel and Tuneel Bana just 5 mins walk to Radmasgatan station on the green line. lot's of nice places just around the hotel. Hotel Hansson This rating is a reflection of how the property compares to the industry standard when it comes to price, facilities and services available. It's based on a self-evaluation by the property. Use this rating to help choose your stay! One of our best sellers in Stockholm! 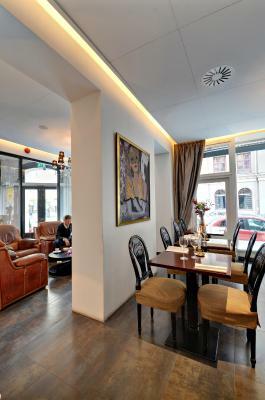 This family-owned hotel is located in a charming 18th-century building in the quiet Vasastan neighborhood. It offers a popular breakfast buffet and rooms with wooden floors, traditional interiors and flat-screen TVs. 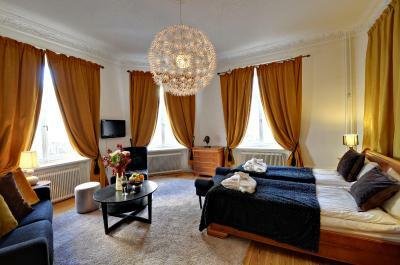 Hotel Hansson has rooms with high ceilings and period décor. All have a seating area and cable TV channels. 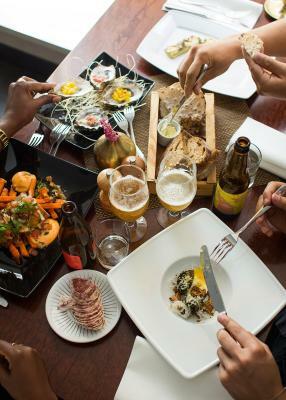 Hansson's restaurant focuses on classic Swedish fish and seafood such as salmon and oysters. 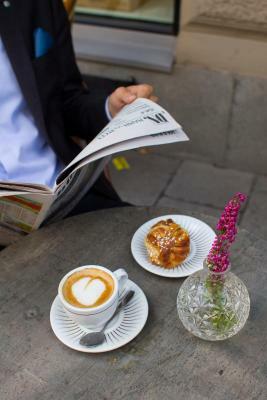 Staff will happily recommend local cafés, bars and attractions. Guests can use a nearby gym at discounted rates. 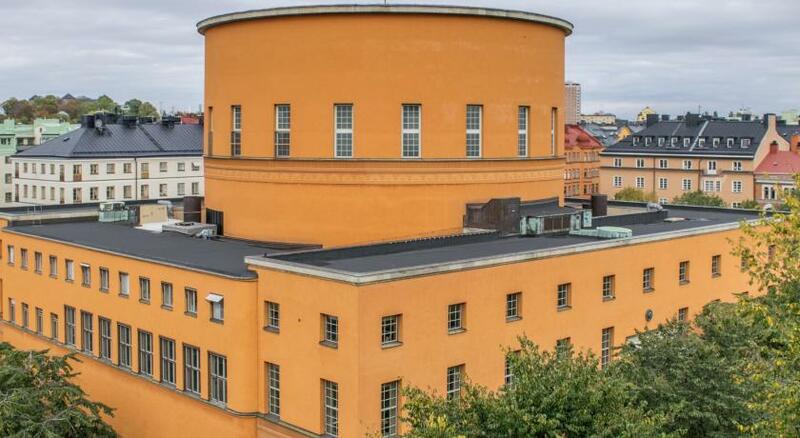 Rådmansgatan Metro Station is 1,000 feet from Hansson Hotel. Stockholm Central Station is only 3 stops away. 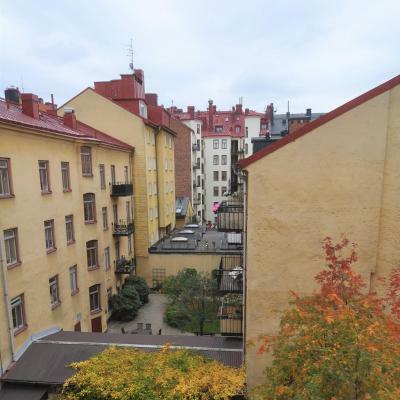 Vasastan is a great choice for travelers interested in architecture, city trips and city walks. 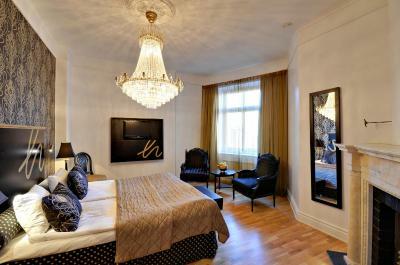 When would you like to stay at Hotel Hansson? Classically decorated room with a sitting area and flat-screen TV with cable channels. Private parking is available on site (reservation is needed) and costs SEK 390 per day. Classically decorated room with a seating area and flat-screen TV with cable channels. The third bed is a fold-out bed. Children staying must be 18 years or younger. Two of the beds are fold-out beds. 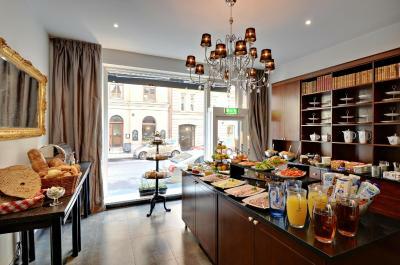 Top-floor luxury design room with beautiful city views.The room also offers bathrobes and slippers for SEK 100 per person. Simply decorated room featuring a seating area and a flat-screen TV. Please note that these rooms are still due to be renovated. 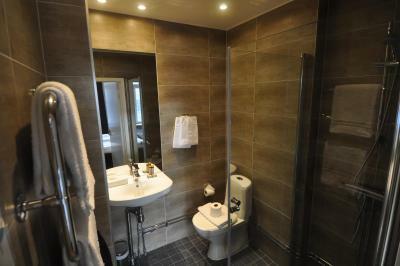 Smaller single rooms with in room private shower and toilet in separate en suite cabinets. 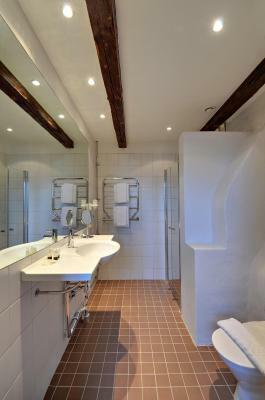 Design rooms with newly renovated bathrooms. Hotel surroundings – This neighborhood is a great choice for travelers interested in architecture, city trips and city walks – Check location Great location - show map Guests loved walking around the neighborhood! 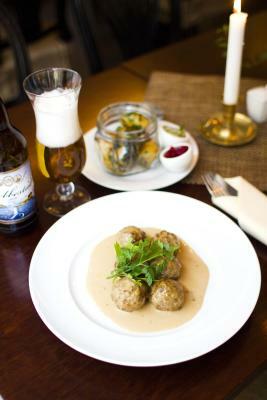 House Rules Hotel Hansson takes special requests – add in the next step! Debit card Hotel Hansson accepts these cards and reserves the right to temporarily hold an amount prior to arrival. Hotel Hansson accepts these cards and reserves the right to temporarily hold an amount prior to arrival. 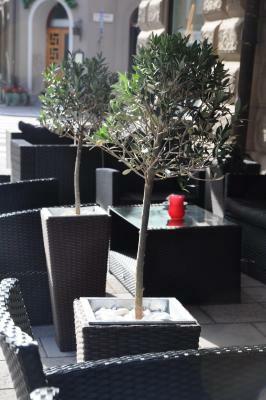 If you expect to arrive after 16:00, please inform Hotel Hansson in advance. Please note that if you choose to pay cash, the hotel requires you to register a credit card to guarantee any extra costs. 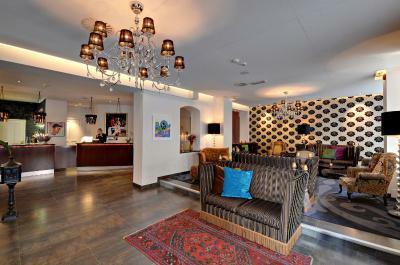 Hotel Hansson can arrange transfer by taxi from and to the airport, please contact the hotel for more information. Please note that when booking for 5 nights or more on a full flexible rate, the property will take a deposit equal to the cost of your first night. Deposits are taken within 24 hours of completing your reservation. This deposit is nonrefundable. When booking for 10 nights or more, different policies and additional supplements may apply. The top floor rooms are not comfortable.Always there are sounds on the top. The staffs are friendly , breakfast is good and above all the location excellent one. First thing that I noticed was a very unpleasant smell. It smelled like spoiled eggs or something - I don't even want to imagine what it was. We tried to keep the windows open but the smell was still there. The room that I got (333) was outdated. I think last time when they renovated or painted the walls was somewhere in the 90s. I didn't mind the old style, I enjoy old buildings, old furniture but the wallpaper and paint was chipped (see the pictures). I didn't feel that the room was properly cleaned. I could see the dust some places. The TV is old and has just 4 or 6 channels and the image wasn't clear. The number of the room attached to the key was very big. You need a bag to keep your key, a pocket is to small. Over the night it was cold even though we keep the radiator on the maximum. You have no facilities in the room: no kettle, no fridge, no airconditioning (not that I need it but I supposed in the summer you will boil there). The private parking is quite expensive. This is why I chose to park on the street. All in all - I woud not come back to this hotel. This is not a 4 stars hotel, rather 2. It's a place where you can sleep if you are not sensitive to the smell, but not a place to enjoy. I liked that the hotel is near the sentrum area. You have a subway station very near or you can walk (this is what i did). It takes 40 to 60 minutes to city center. First day was horrible for us. The electric line was not working properly . We were then dog tired after 24 hours of journey. The front desk, House keeping and breakfast staff were courteous. They were very helpful .We being foreigner felt at home with them. There was no hot water. I don’t think this hotel can call itself a 4 star hotel. The phone in my room didn’t work. I think for a four-star hotel, some parts of it truly require improvements. The most frustrating thing was the description from Booking.com is not matching the hotel reality. So when I booked the room, the room description said that robes and slippers are included, but when I checked in, the staff there said that they have changed that since last year on Booking.com. I showed screenshots to them regarding the room description part so they agreed to provide them through room service lady. However in the end (three-nights-stay), I only received robes, but no slippers. The room is with STONE floor so I wasn’t say it’s nice to walk on it with bare feet. And there are tiny broken stones on the floor as well. The queen sized double bed was made up by two single bed, but have a thin double mattress on top covered by TWO PIECES of SINGLE-BED sheets. So you can probably image how they went in the end. And despite the bed linens didn’t smell, there were some dark colored stains on that thin mattress and the blankets didn’t really fit in their covers. The design of the hangers in the room was very user-unfriendly. When you put on and take off clothing from it, your stuff will drop to floor every time. The temperature of the room looked like to be adjustable, but it turns out to be automatic control so it keeps the temperature around 22 degrees according to the display. BUT the lock two windows were broken so there is constantly cold air coming in. The hotel breakfast was nice, but as a four-star hotel, it’s kind of limited in choices. And one thing that makes me super uncomfortable was that there were some little flies in the muesli section so when you scoop corn flakes or nuts or oats, they would fly out. My room was on the top floor, not too much ‘city view’ but the surprise was that you can see sun rise through the window. That was pretty awesome to be honest. 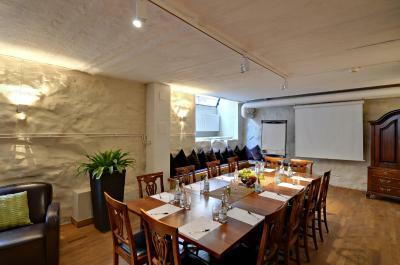 The size of the room is very comfortable, completely suitable for two people and even with large suitcase. The location of it is good enough, a couple of minutes walking from Odenplan station, not feeling that far even when carrying heavy suitcase. And there are many interesting dining places with different price ranges. The bathroom is renovated but the basin is a mini one, no possibility to hang nothing, no protection for the water coming from the shower. 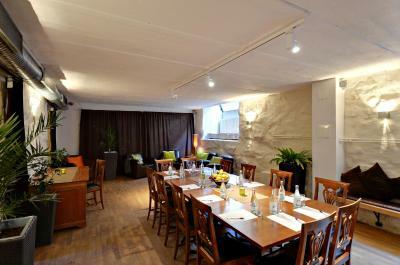 The beds were very comfortable, WiFi was stable and good, breakfast was superb, with a lot of variety. The beds are a bit uncomfortable. The breakfast is amazing, wide variety of food and delicious. The staff are very friendly and very eager to help you. We really hated the bed, it was just a piece of sponge on some springs on two beds pushed together. it was awful and we have come back home with sore backs. We loved the hotel, the reception, breakfast, the bathroom and generally it was great. 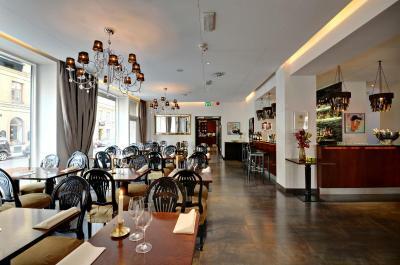 It is in a nice area of Stockholm and close to a main street with loads of restaurants and shops. it was not far to get anywhere either. all is good like always! I still don’t understand, why did they call in 4* hotel! Incredible dust on every possible surface man can see, squalid beds a la student dormitory (by the way, don’t you hope for a king-size bed! You and your loved one will be divided by a deep ravine between two mattresses!). You are lucky if your room will be prepared and cleaned by your arrival. We weren’t that lucky. Carpets or rugs on the floor? Never heard about that! You must be an early bird to catch breakfast (6:30-8:30), so if you love to sleep longer- stay hungry! 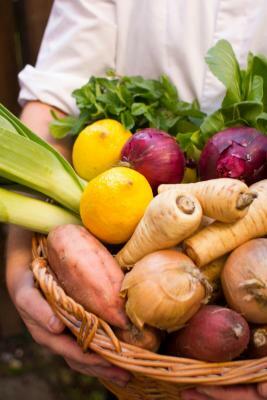 this establishment leaves a dual impression, on the one hand there is dirt and disorganization, on the other hand, very nice friendly staff who somehow smooth out the unpleasant atmosphere. but when at the end you get the bill the mood deteriorates, because the price per night is crazy for this quality. Alas. The hotel seems ok. Cute little lobby with cozy old chairs, very clean bathroom and beddings. Fair tasty breakfast, friendly personnel, very quiet. TV almost no stations with poor reception. Car parking is too onerous on the guest. No dinner available on Mondays. Breakfast, lift is old technology and good fun.